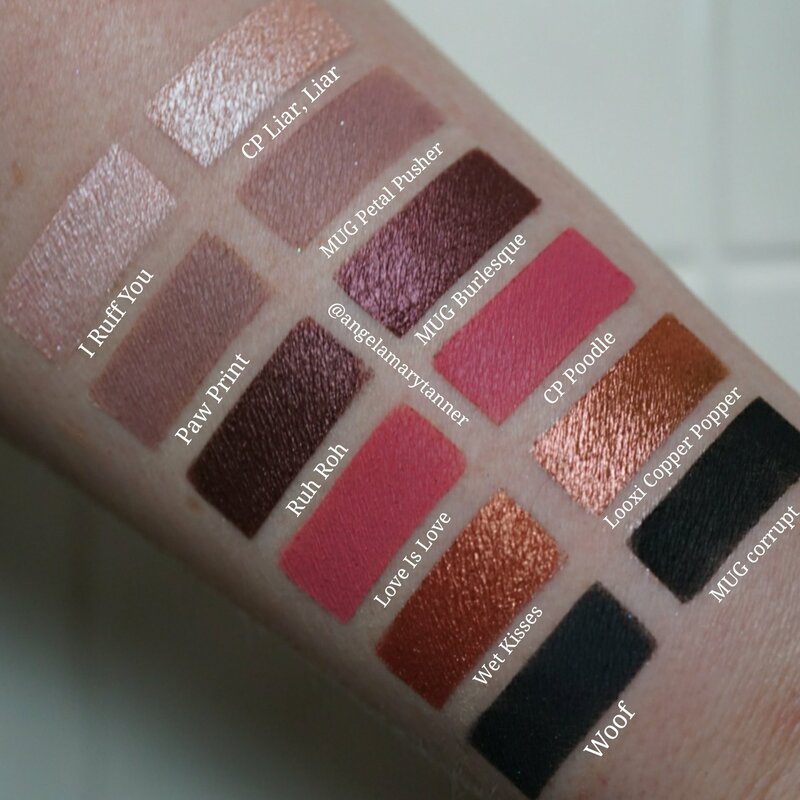 Puppy Eyes vs Makeup Geek White Lies ($6)- so after spending two days doing all these swatches and editing 10,000 pics, I went to link White Lies only to realize it was discontinued. Kill me. Luckily it turns out that their Ice Queen shadow is an even better dupe. 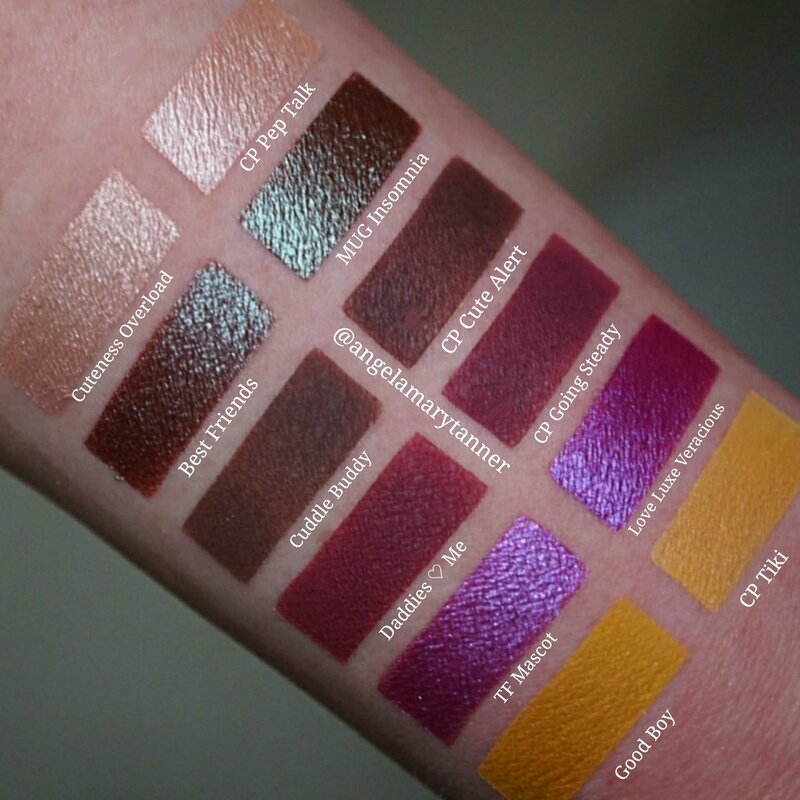 Obviously I’d rather get rectal cancer than redo all of the swatches and editting so I’m inserting some quick finger swatches below for reference. These are both sparkly whites. 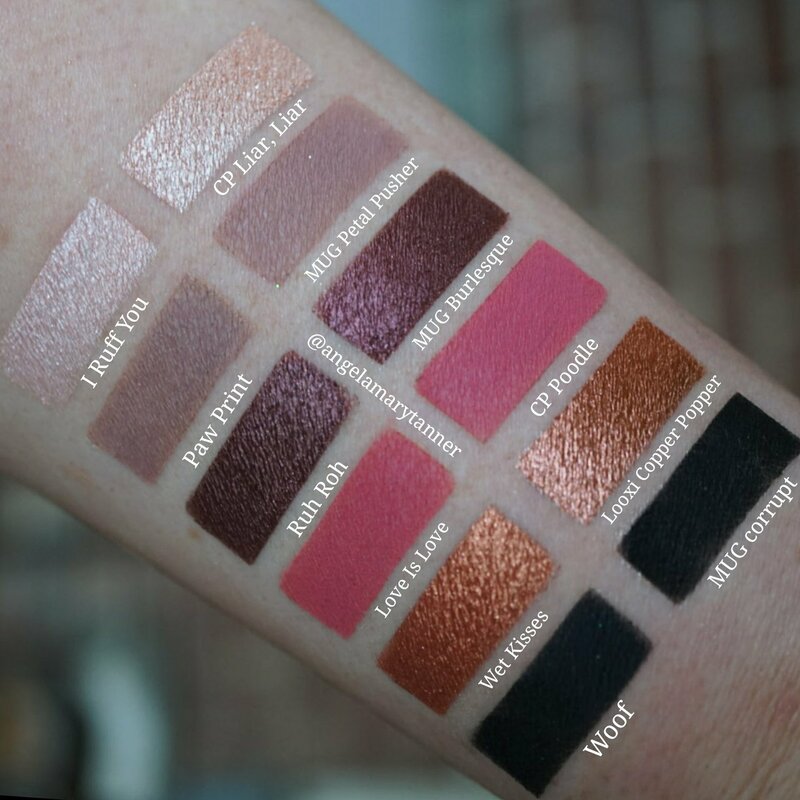 Puppy Eyes is by far the worst shade in the palette, IMO. So even though Ice Queen is on the powdery side, it still performs much better than Puppy Eyes. 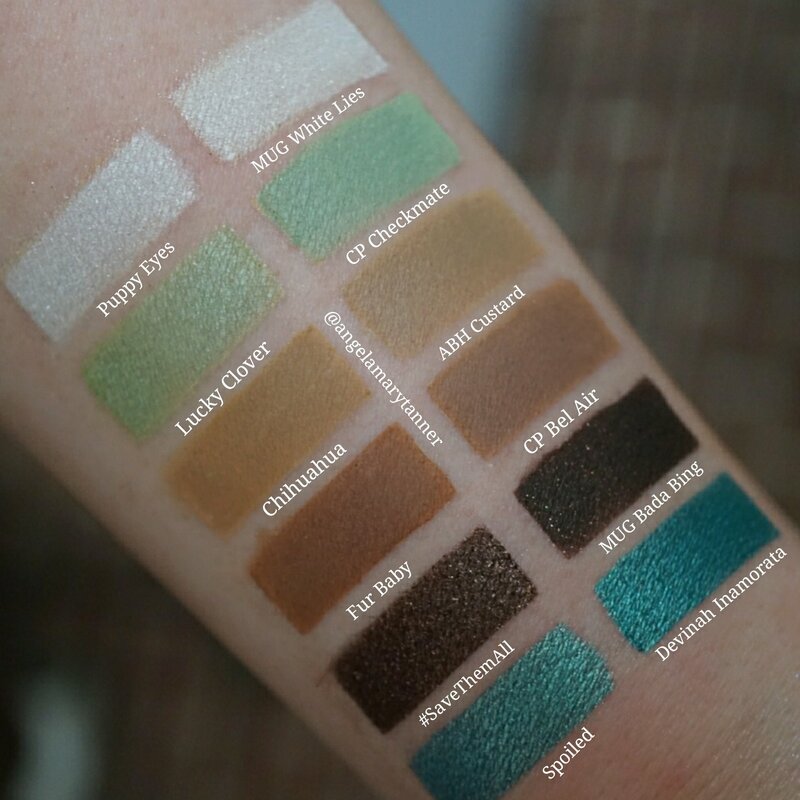 Lucky Clover vs Colourpop Checkmate ($4)- both are pastel green mattes. Checkmate is more of a mint green so next to Lucky Clover it looks slightly more blue. 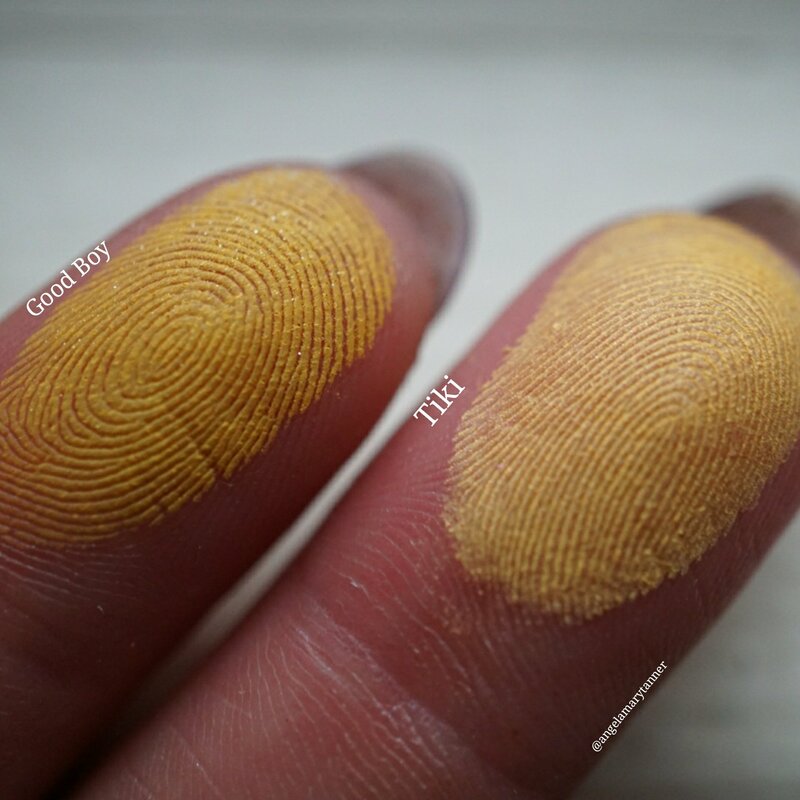 Chihuahua vs ABH Custard ($12)- both are golden ochre mattes. To my eye, they’re identical. 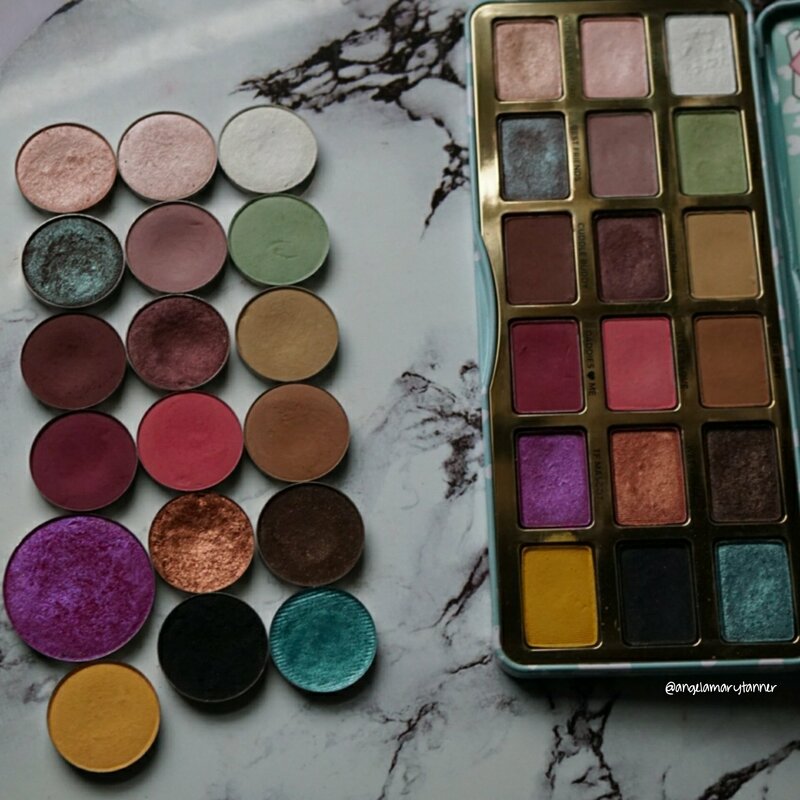 *sidebar- when I dupe a palette I always start the search with my MUG and CP palettes because they’re popular brands with large color selections and they’re affordable. If I strike out with those two, I move on to my indie stash. It’s only as a last resort that I use something that costs more than 5 or 6 bucks as a dupe. 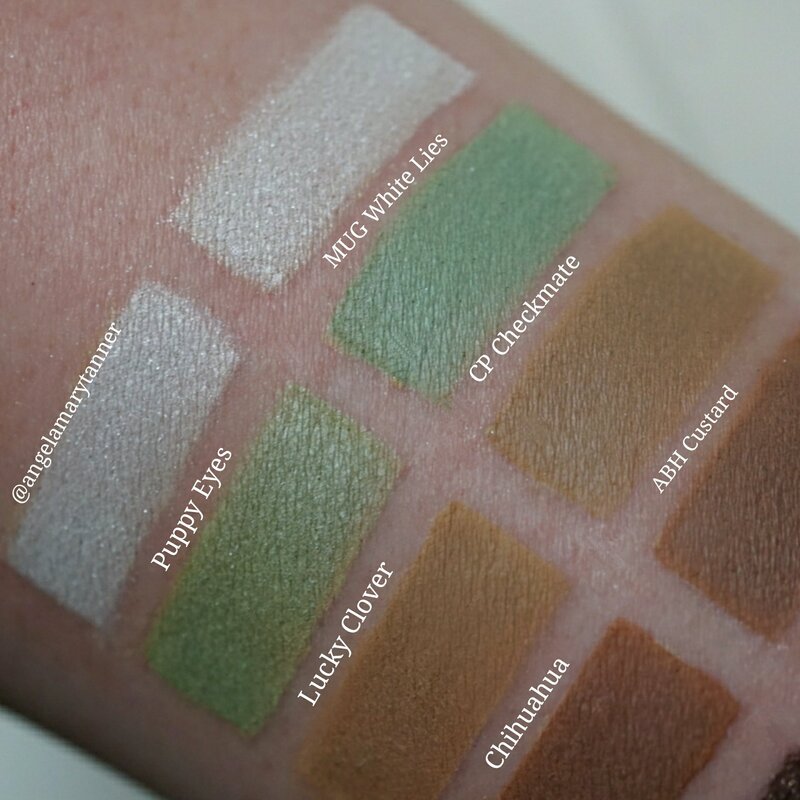 You’d think that a basic color like Chihuahua would be easy to dupe but Custard was literally the only single shadow in my collection that qualified as a dupe. Fur Baby vs Colourpop Bel Air ($4)- both are milk chocolate mattes. Bel Air is lighter and a little more cool toned. 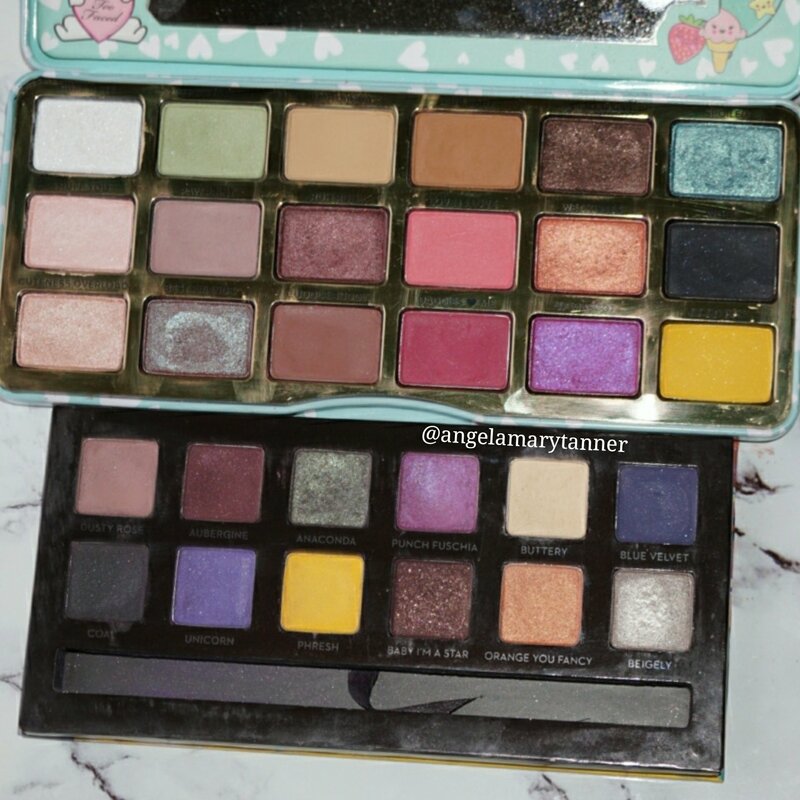 #SaveThemAll vs Makeup Geek Bada Bing ($6)- these two are glittery dark browns. #SaveThemAll has a more metallic finish than Bada Bing. 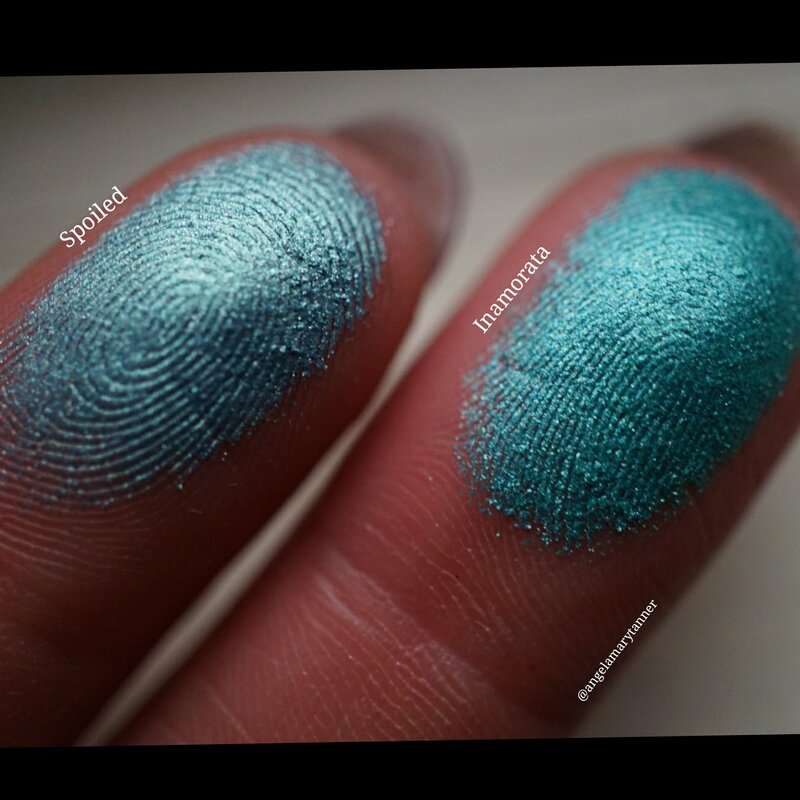 Spoiled vs Devinah Cosmetics Inamorata ($4, with code BEAUTYCULT)- both are metallic aqua blues. Spoiled is a bit more green. 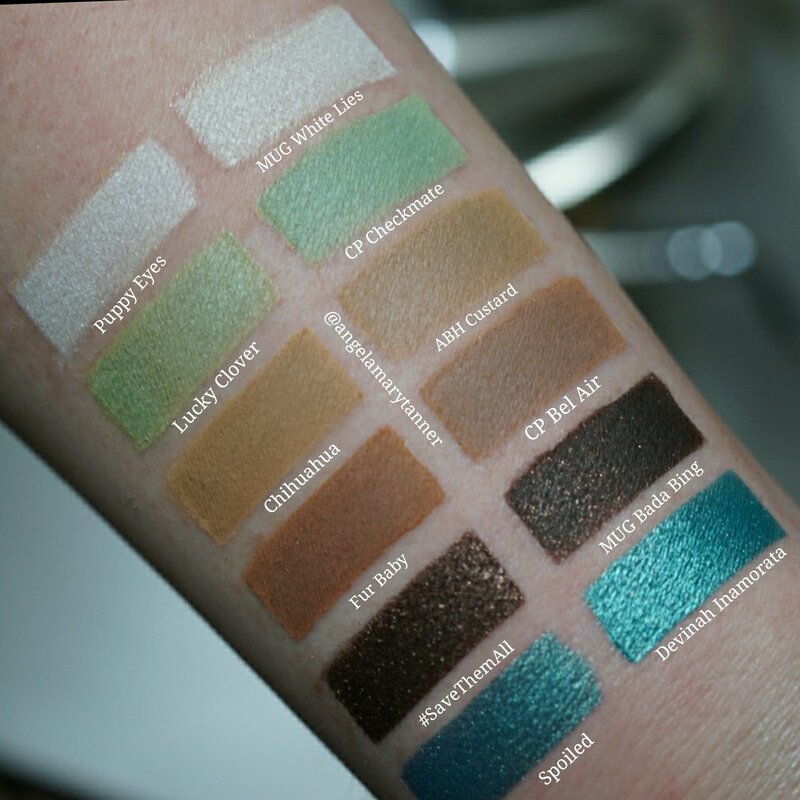 My first choice for this one was MUG Mermaid but thankfully I realized that it was discontinued before I started swatching. I Ruff You vs Colourpop Liar, Liar ($4)- both are pearlized peachy pinks. Liar, Liar is more peach. 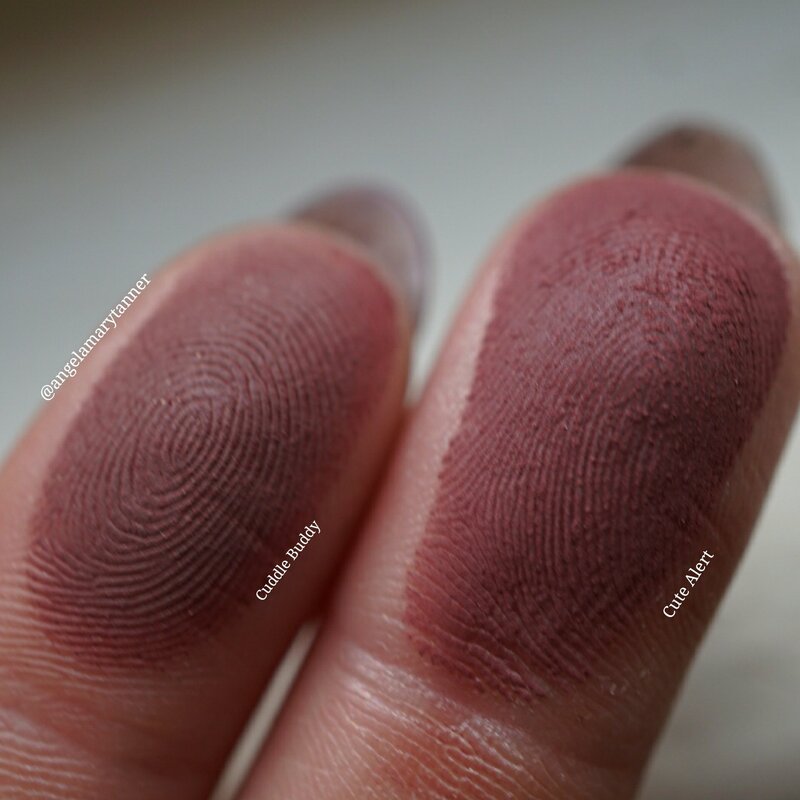 Paw Print vs Makeup Geek Petal Pusher ($6)- these two are dusty rose mattes. 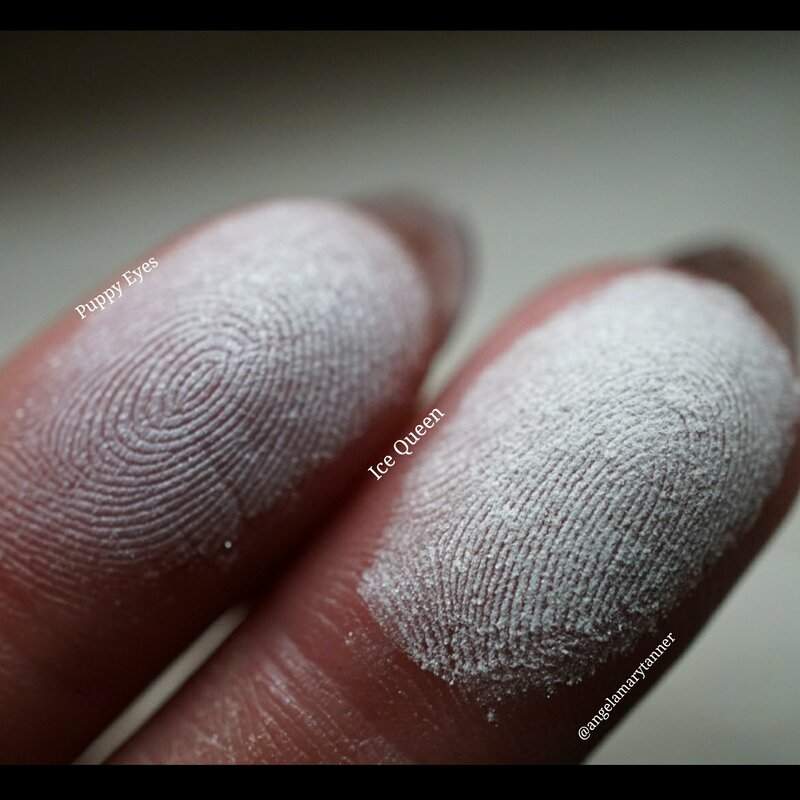 Paw Print pulls more mauve than Petal Pusher, which is more pink. Two better dupes would be ABH Buon Fresco, which is $12 or Colourpop Chic Happens, which is only sold as part of the Saucey quad. 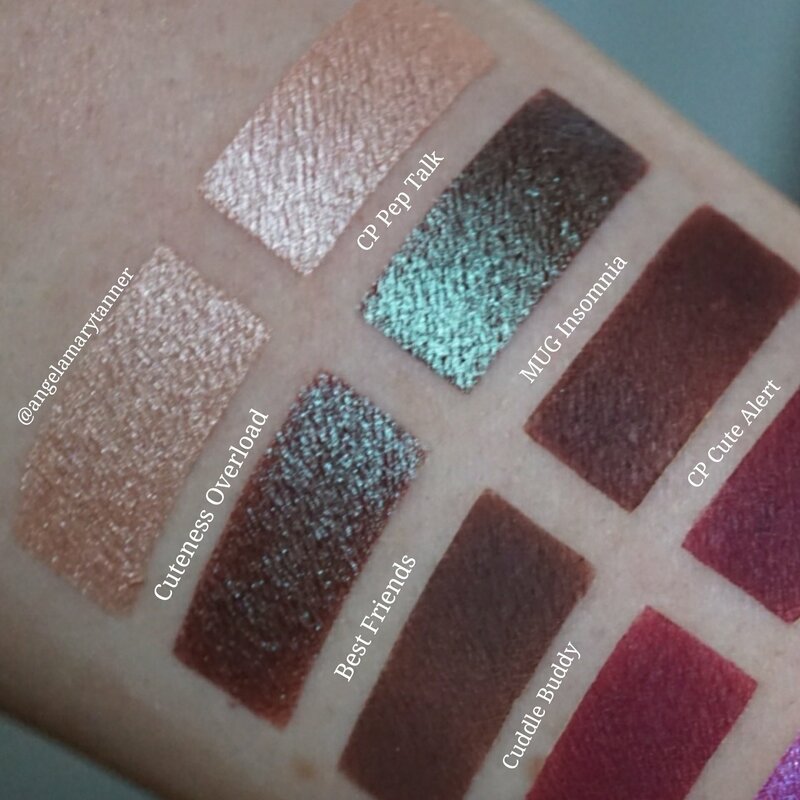 Ruh Roh vs Makeup Geek Burlesque ($6)- both are burgundy metallics. 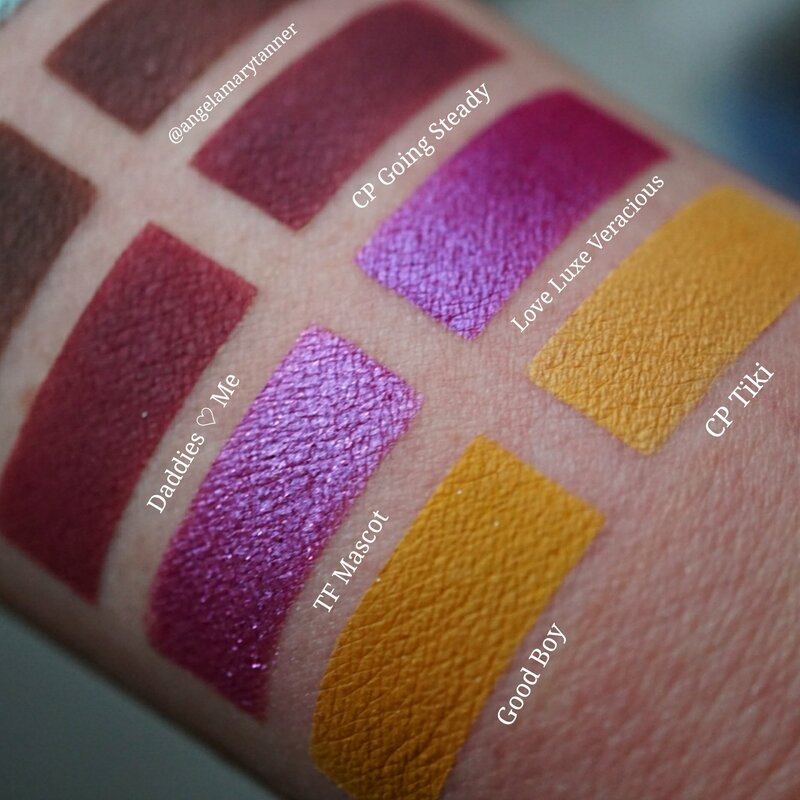 Ruh Roh has stronger purple undertones and Burlesque pulls more red. 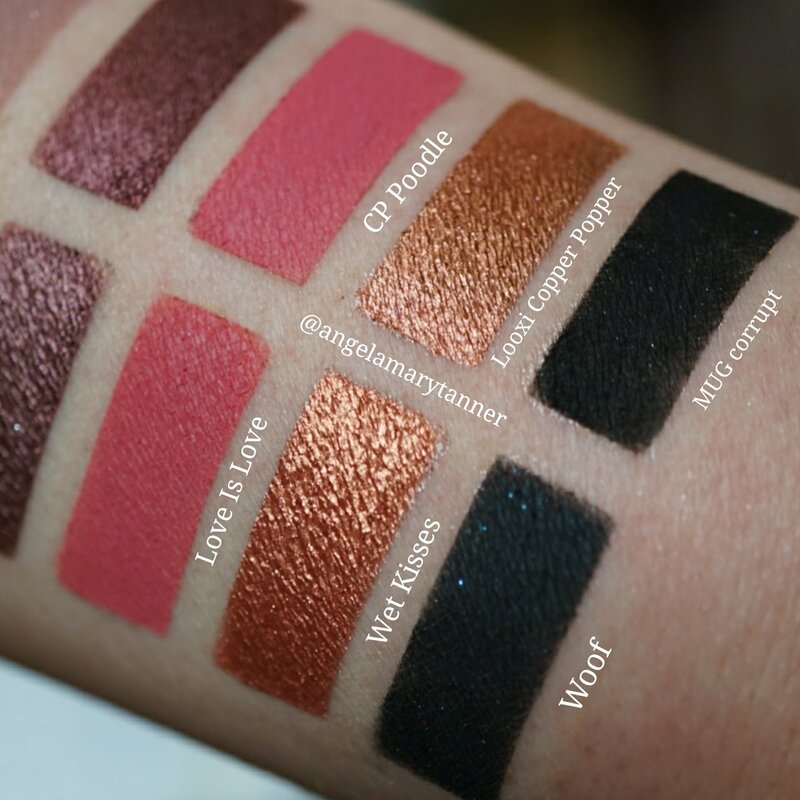 Love Is Love vs Colourpop Poodle ($4)- both are hot pink mattes. Poodle is slightly darker and more pigmented. 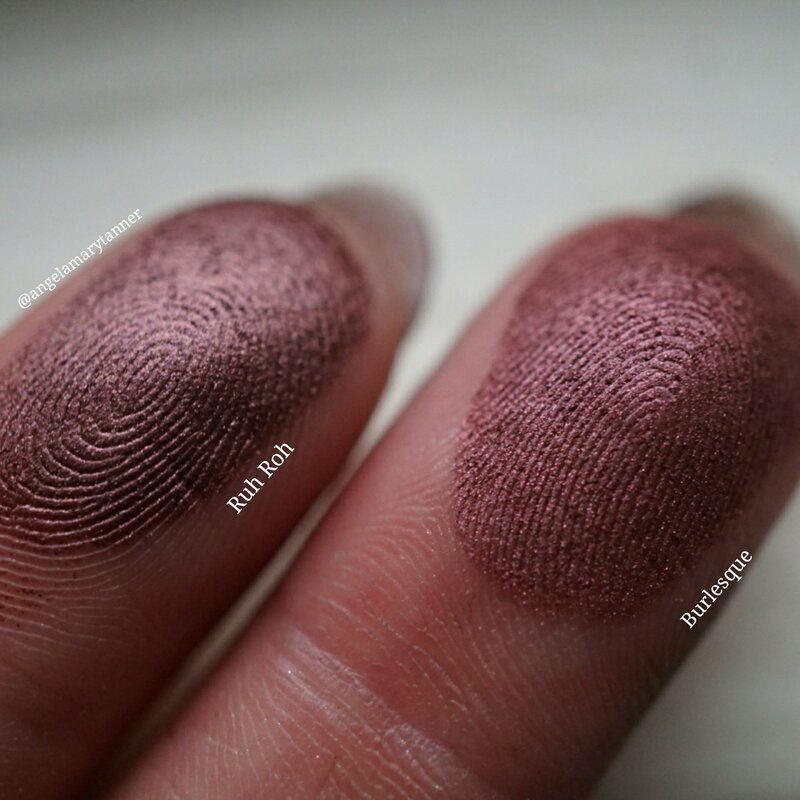 Wet Kisses vs Looxi Beauty Copper Popper ($4.50, with code BEAUTYCULT)- these two are copper shimmers with pink undertones. Wet Kisses is a little more red. ABH Rose Gold is a perfect dupe. Woof vs Makeup Geek Corrupt ($6)- Woof was my one failing. It’s a blackened navy blue matte with blue glitter. 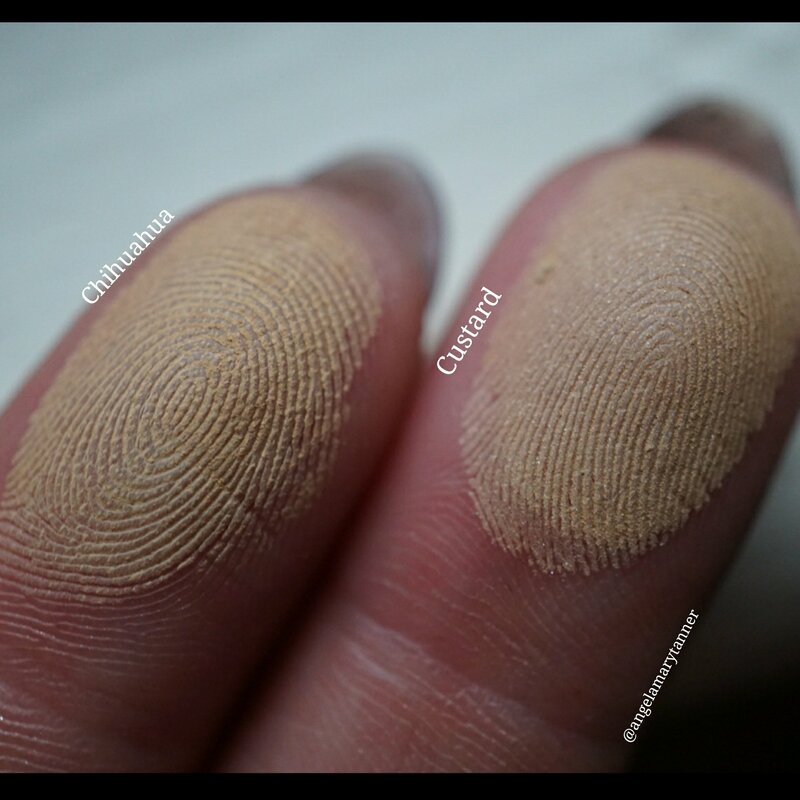 In normal application the glitter doesn’t adhere to the skin. 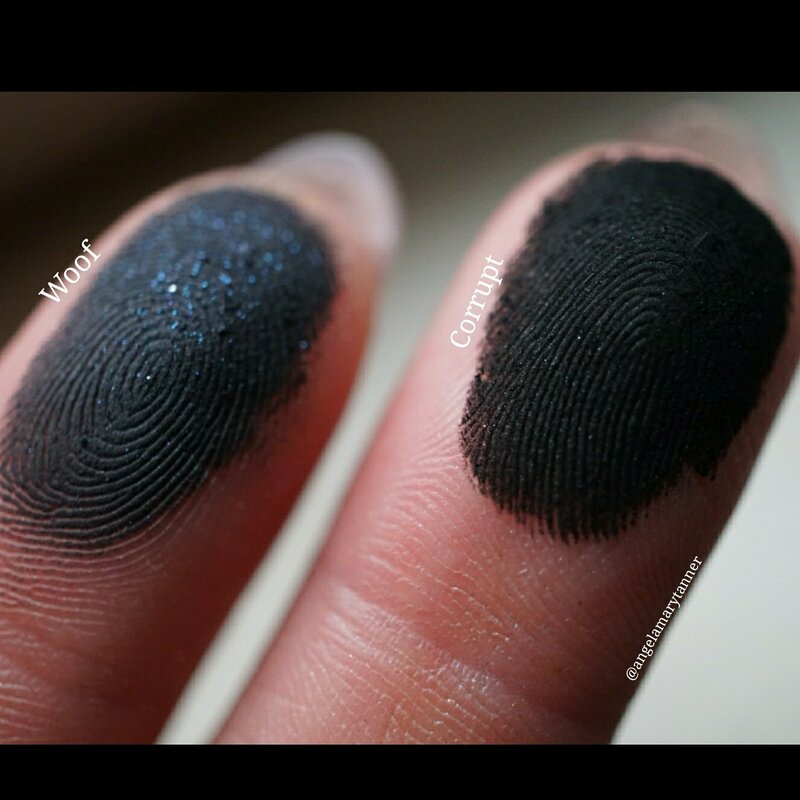 I had to press my fingertip to the pan to get the glitter to show up in the photo below. It’s such a dark navy that it looks black which is why I choose Corrupt as my dupe. I did come across a single shadow that would’ve been a much closer alternative, Nars Night Flight but that one costs $26, so there was no way that I was using it. 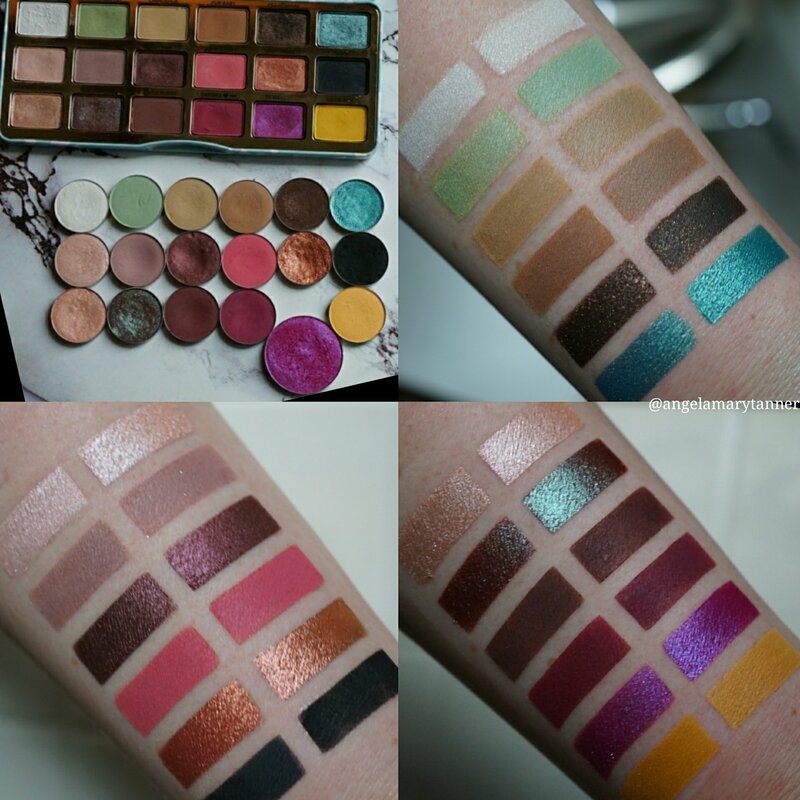 I found a few other similar colors but they were all in palettes and I only use dupes that are sold separately. Cuteness Overload vs Colourpop Pep Talk ($4)- both are ivory with a pearlized finishes. Pep Talk is more peach. 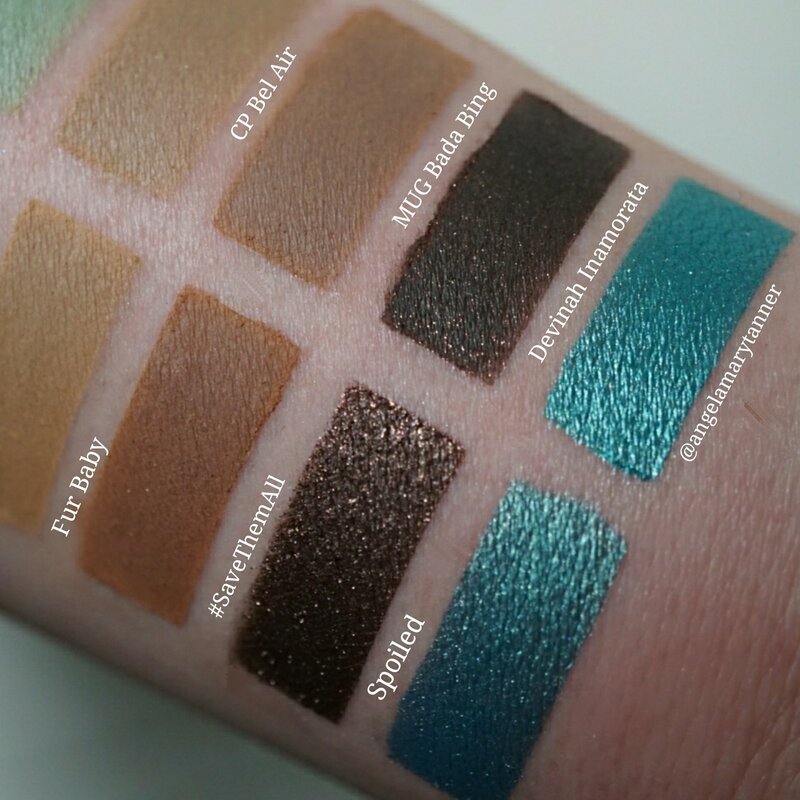 Makeup Geek Shimma Shimma is another good option. 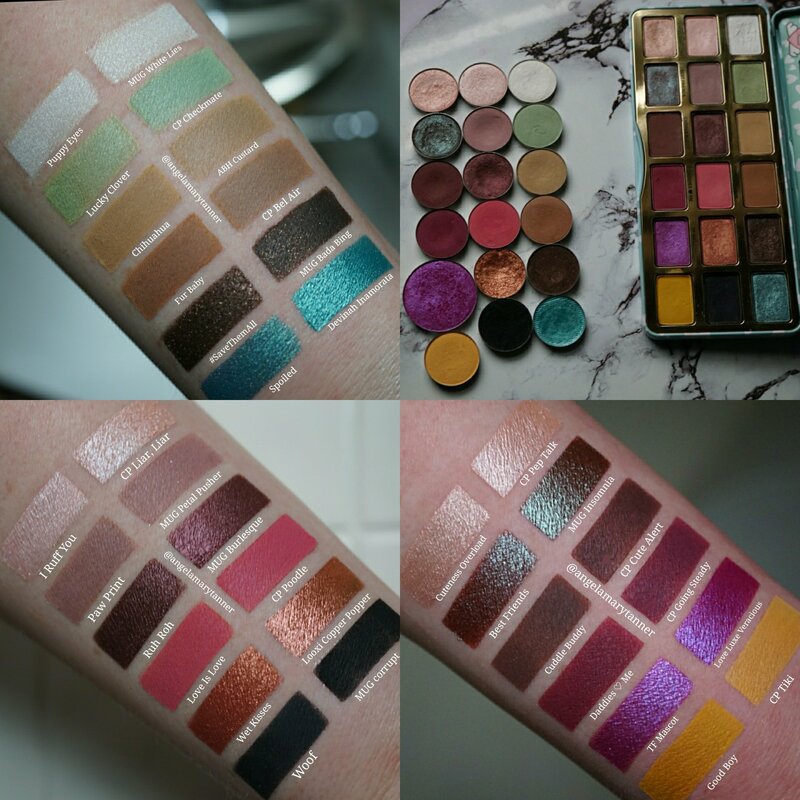 Best Friends vs Makeup Geek Insomnia ($6)- Best Friends has a burgundy base with a heavy teal overlay. Insomnia is darker and a little more green. Cuddle Buddy vs Colourpop Cute Alert ($4)- Cuddle Buddy is a dark red brown with a matte finish. Cute Alert is more red. ABH Red Earth is a closer dupe but it costs $12. Daddies ♡ Me vs Colourpop Going Steady ($4)- Daddies ♡ Me is a matte raspberry. Going Steady is slightly more purple. TF Mascot vs Love Luxe Veracious ($9, with code BEAUTYCULT)- TF Mascot is a bright fuchsia with a blue violet shift and glitter. I was having a really hard time with this one until I remembered Veracious. Veracious is extremely similar in color but TF Mascot is glittery and a little bit lighter. 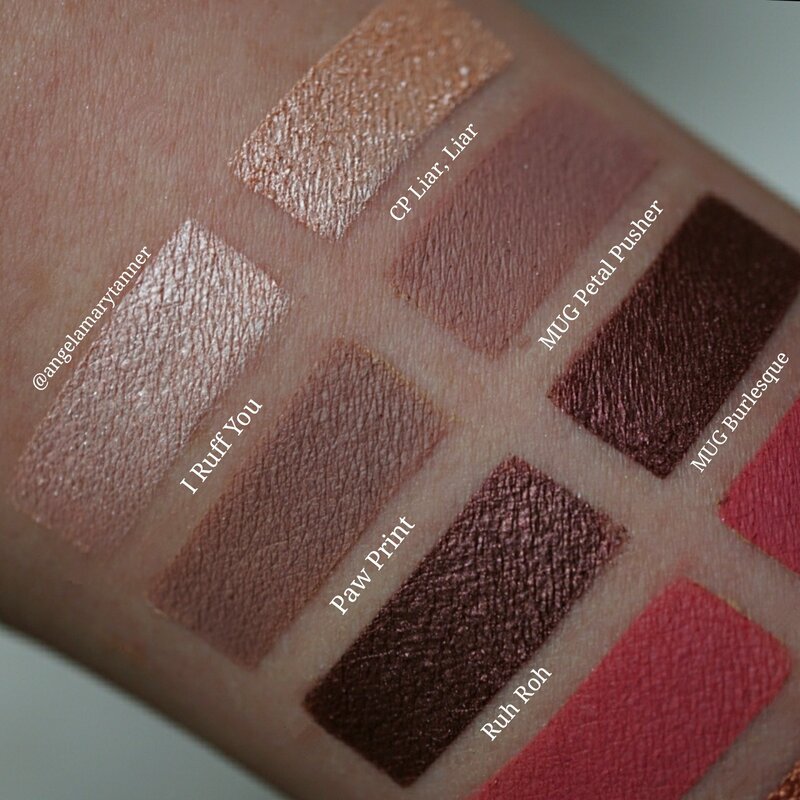 While I was hunting for a TF Mascot dupe, I realized that there’s a lot similar colors in the ABH Artist palette. The Artist palette has been gone a long time but I’m including a pic in case you happen to have it. There’s 7-8 colors that might be dupes. Good Boy vs Colourpop Tiki ($4)- Good Boy is a bright yellow matte. Tiki is lighter. Next COLOURPOP’s Super Shock Cheek extension! Thank you so much for the extremely thorough job you did here. You just saved me a bunch of money and I am forever in your debt.